Originally published as Scientific Research, this pair of volumes constitutes a fundamental treatise on the strategy of science. 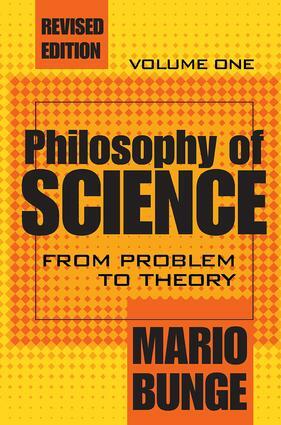 Mario Bunge, one of the major figures of the century in the development of a scientific epistemology, describes and analyzes scientific philosophy, as well as discloses its philosophical presuppositions. This work may be used as a map to identify the various stages in the road to scientific knowledge. Philosophy of Science is divided into two volumes, each with two parts. Part 1 offers a preview of the scheme of science and the logical and semantical took that will be used throughout the work. The account of scientific research begins with part 2, where Bunge discusses formulating the problem to be solved, hypothesis, scientific law, and theory. The second volume opens with part 3, which deals with the application of theories to explanation, prediction, and action. This section is graced by an outstanding discussion of the philosophy of technology. Part 4 begins with measurement and experiment. It then examines risks in jumping to conclusions from data to hypotheses as well as the converse procedure. Bunge begins this mammoth work with a section entitled "How to Use This Book." He writes that it is intended for both independent reading and reference as well as for use in courses on scientific method and the philosophy of science. It suits a variety of purposes from introductory to advanced levels. Philosophy of Science is a versatile, informative, and useful text that will benefit professors, researchers, and students in a variety of disciplines, ranging from the behavioral and biological sciences to the physical sciences.